Home > Blog > Forest Restoration Gets a Tiny Fraction of the Money It Needs. How to Fill the Gap? 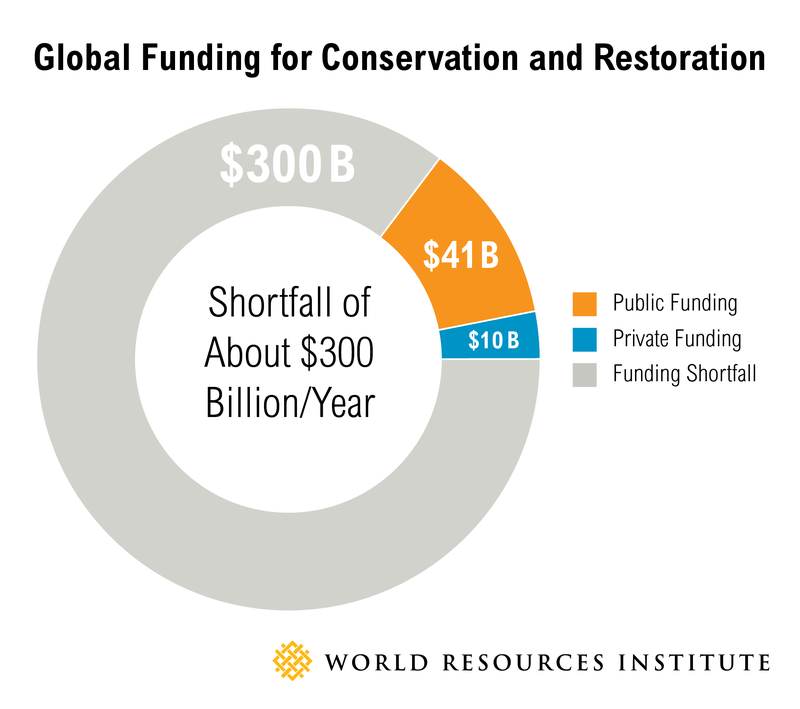 Forest Restoration Gets a Tiny Fraction of the Money It Needs. How to Fill the Gap? A 2014 report by the New Climate Economy noted that restoring just 12 percent of degraded agricultural land in the world could feed an additional 200 million people by 2030, while providing environmental benefits. Thirty-one countries have made commitments through the Bonn Challenge, a global initiative to restore 150 million hectares of degraded land by 2020 and 350 million hectares by 2030. And new regional restoration initiatives have emerged in Africa and Latin America and the Caribbean. Research shows that only 13-17 percent of the total annual funding needs for restoration and conservation are met—about $50 billion. That means there is a shortfall of $250-350 billion per year. Of the money available, most comes from government or philanthropic sources, with only $10 billion per year invested by the private sector. Addressing this financing gap with both private and public funds is key to expanding restoration on a global scale. However, the private sector is usually interested in a return on investment, which has been difficult to enumerate since the costs of restoration are more easily measured than the benefits. Also, investment capital needs to align with the longer timeframe of restoration projects, and business models and policies must be conducive to large-scale restoration. Komaza is one example. Based in Kenya, the company is pioneering an approach known as “microforestry” by working with smallholder farmers to plant eucalyptus and Melia volkensii trees on their land. Komaza purchases the trees and manages the value chain from nursery to harvest. By purchasing trees from thousands of smallholder farmers near the major port of Mombasa, Komaza is able to build the supply of a plantation while bypassing the traditional plantation model, which often requires large areas of land and has high transport costs. There is a funding chasm between small grant providers who write checks of $200,000 and institutional investors who may be interested only in ideas that are $200 million and up. So, as we mobilize capital for restoration, we’ll need to engage investors like Althelia. With $120 million slated for investment in restoration projects through Initiative 20x20—a program to restore more than 20 million hectares of degraded land in Latin America by 2020—Althelia is accelerating the pace of restoration, generating impact while producing an investment return. 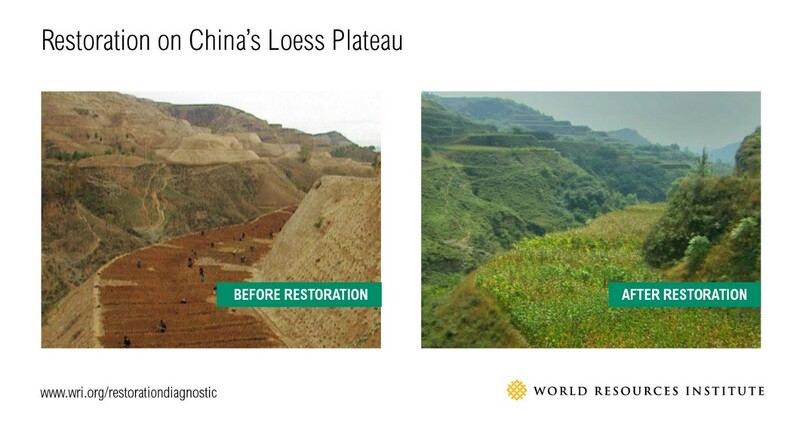 China’s Loess Plateau is a prime instance of how restoration policy has a dramatic impact. In the 1980s and 1990s, deforestation and unrestricted grazing led to rapid soil degradation and sandstorms in the country. By the 2000s, however, bans on these activities—coupled with intensive reforestation programs—had transformed the once barren landscape into lush plains. LEARN MORE: Visit our website here.